Looking at the photograph it is doubtful whether more than a tunnel, it is a cave. In fact, both responses should be correct. It’s a tunnel, but it is also a cave. Or rather, every 6 kilometers along the path of the tunnel, was built a huge cave, painted with bright colors. And this is not a bizarre artistic sense of its builders, but a precise design choice. In fact, the greatest danger that we run along the 24.51 km of Laerdal tunnel in Norway, is not caused by traffic, almost non-existent for our standards, but to get caught up in boredom and lose the points of reference; in short, to fall into a kind of daze, very dangerous while driving. Not to mention of those who are suffering from claustrophobia. 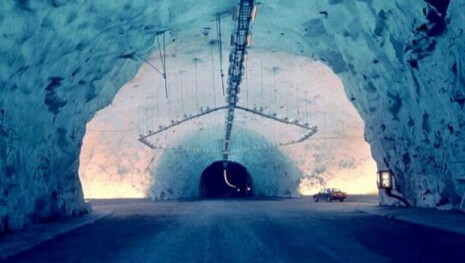 The Laerdal tunnel, with its 24.51 km in length holds the record for the longest road tunnel in the world; no station, no subway, but road. Opened in 2000, allows travel between Oslo and Bergen without having to take a ferry, even in winter. Ah, even when you do not pay the toll.